Everyone deserves to have a straight, beautiful smile. For many however, the idea of having to get metal braces that and are known to be painful will keep them from asking their dentist about having their smile straightened. That is where Smart Moves aligner systems can help. What are Smart Moves aligners? Smart Moves is a series of virtually clear dental aligners that gradually straighten your teeth without the use of braces. Each series contains two aligners, with each aligner being worn for two to three weeks, depending on how far your teeth need to be moved. Once your teeth have reached their desired position, your treatment will be complete. 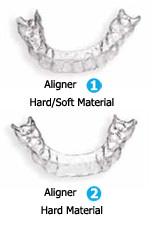 In most cases, patients will need anywhere from two to six aligners to achieve their straightest smile possible. What are the benefits of Smart Moves aligners? Smart Moves aligners are designed to be clear and comfortable, making them virtually unnoticeable to others wearing them. Because they fit snugly, Smart Moves aligners won’t affect your speech the way that traditional braces can; you’ll be able to proceed through your day normally with complete confidence. The aligners are also removable, meaning that there will be no need to change your diet or lifestyle. You will be able to remove the aligners to eat, brush your teeth, and floss normally. Smart Moves aligners are custom molded to fit your teeth. This means that unlike traditional braces, there are no uncomfortable wires or metal brackets that can cause abrasions or irritation to the inside of your mouth. This makes Smart Moves aligners far more comfortable and convenient than traditional braces. They also do not need adjusting; you’ll be able to switch to your next aligner yourself when it is time. This means that you’ll have fewer visits to your dentist’s office during your treatment. Where traditional braces can sometimes require a visit to your dentist for an adjustment every two weeks, when using the Smart Moves system your dentist will only need to check your progress every four to six weeks. How do I care for my Smart Move aligner? Caring for your Smart Moves aligner is simple. Each day you will remove your aligner carefully and use cool water and a non-abrasive toothpaste to brush your aligner clean. Your dentist will be able to recommend a toothpaste that is appropriate for use with your Smart Moves system. They will also recommend a special soak that will be used to disinfect your aligners appropriately, as it is important that you do not use traditional mouthwash to soak your Smart Moves aligners. These products may contain alcohol, colorants, or effervescent cleansers that may discolor or damage your aligners. Are Smart Moves aligners right for me? Smart Moves aligners are an excellent solution for the majority of patients. However, it is best to consult with your dentist to ensure that you would be a good candidate for the Smart Moves system. Call Larry Picard, DDS today at (310) 479-4500 and schedule a consultation appointment. He looks forward to helping you achieve your best and brightest smile.